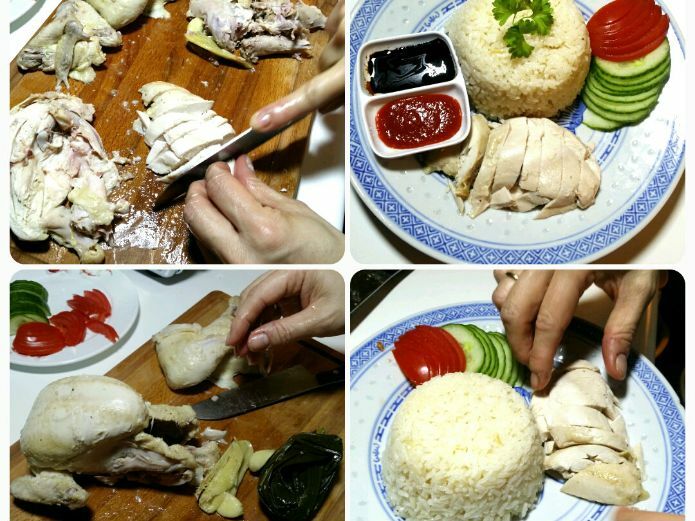 For making Hainan Chicken Rice recipe click on the link. Buy fresh pandan leaves at Chinese supermarkets or frozen packages, if none available you can substitute with spring onion or young leeks. To handle the leaves for stuffing and cooking, tie 3-4 leaves into a knot as shown in the image here below. 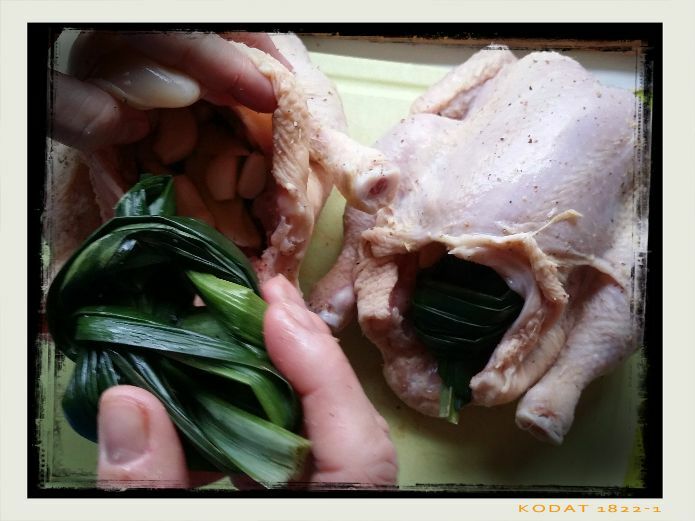 For us a distinct Hainan Chicken Rice flavour is steeping the stock with Pandan leaves, it enhances unique fragrance. 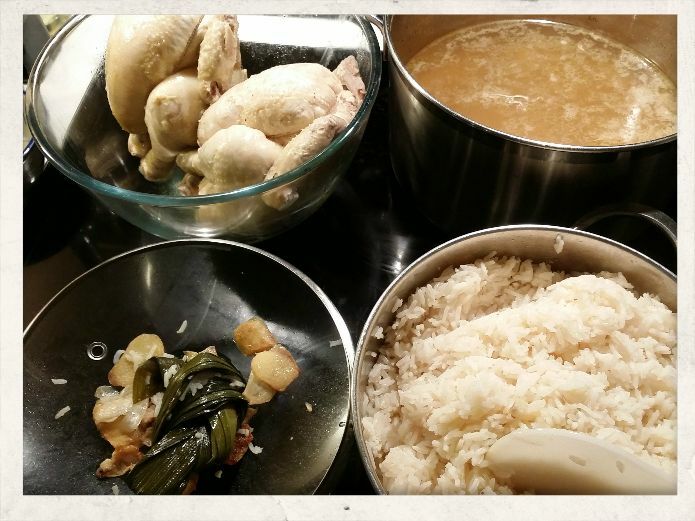 My home recipe for Singaporean style how to teach my kids to cook this dish. Like any great dish, every Singaporean cook has its very own recipe. 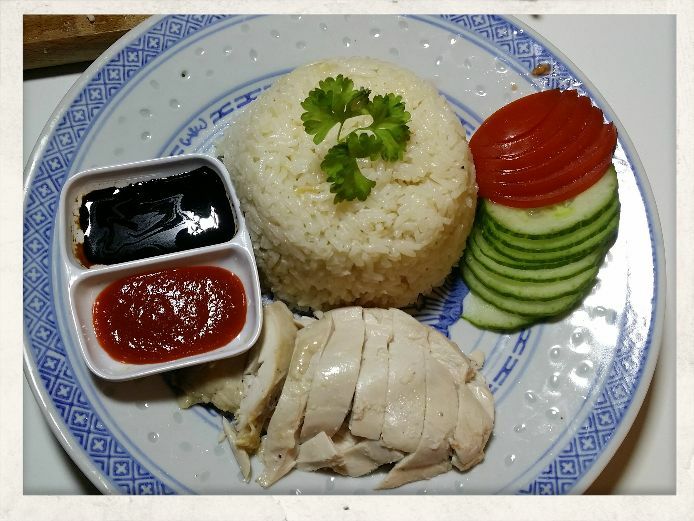 Suggestions for Chinese stock methods and variations or Hainan Chicken Rice – food chat trivia, click on the links. Luckily we all share one big secret ingredient. “Love” to eat, create and share. Preparing chickens; have everything set up and ready. 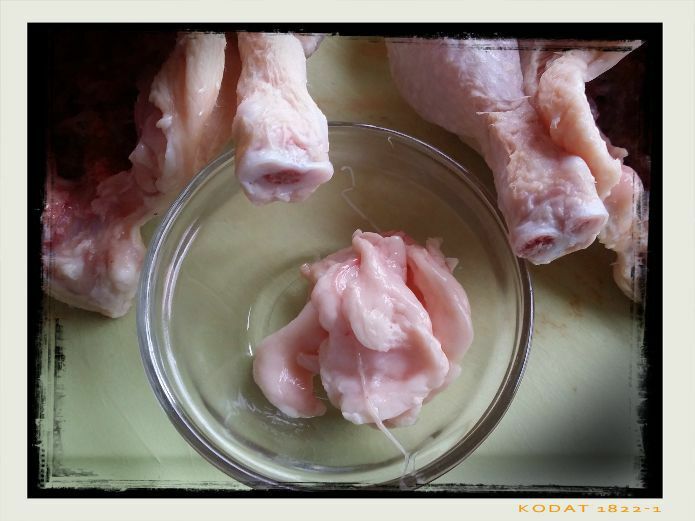 Remove chicken fat and set aside for use in stock or making chilli paste. Stuff cavity with whole garlic cloves, ginger slices followed by the pandan knots. This will prevent the stuffing from falling out and locks everything in for great aroma development. 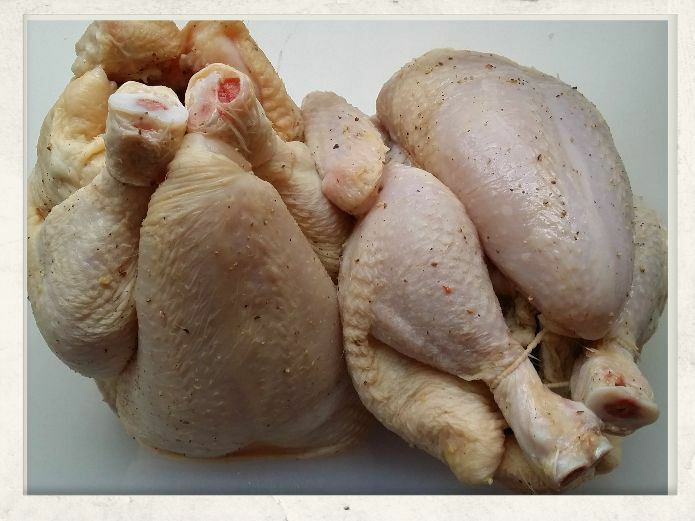 Tie up the chicken legs, so it is easier to lift and lower the chickens into the stock. 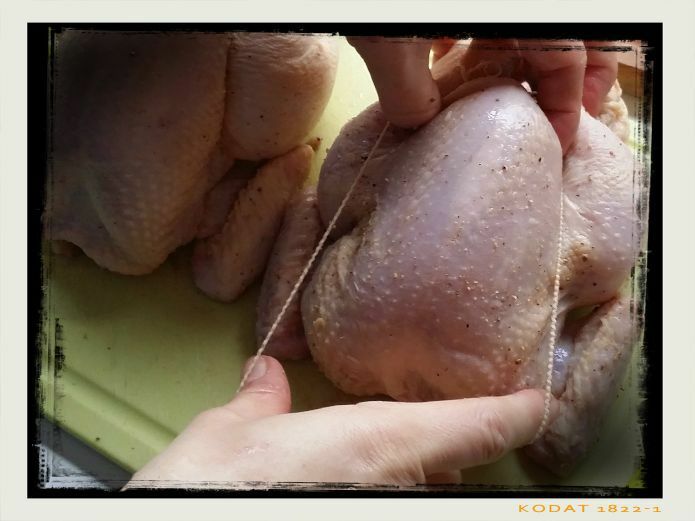 Tie up the chicken with the packaged food elastic or butcher’s twine. Chicken prepared, marinating time will do its work blending the flavours. Transfer the chicken to a container and marinate the chicken in the fridge for 6-8 hours or overnight. 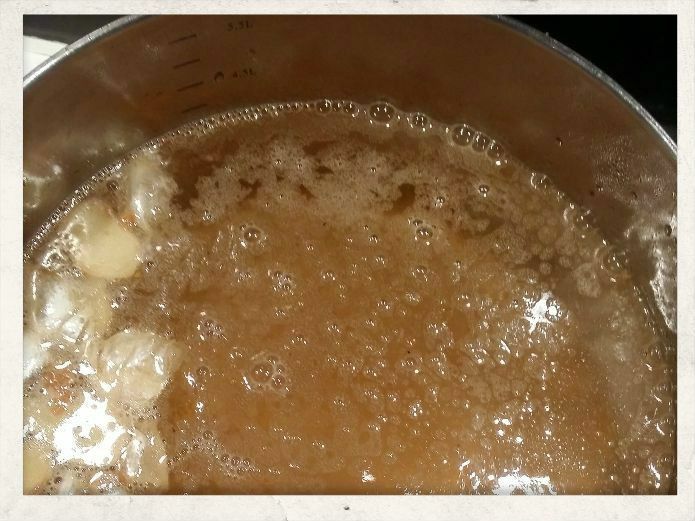 Fry the chicken fat add ginger, garlic, Chinese wine, light soy sauce, a dash of sesame oil. Fill the pan with 4 litres of water. 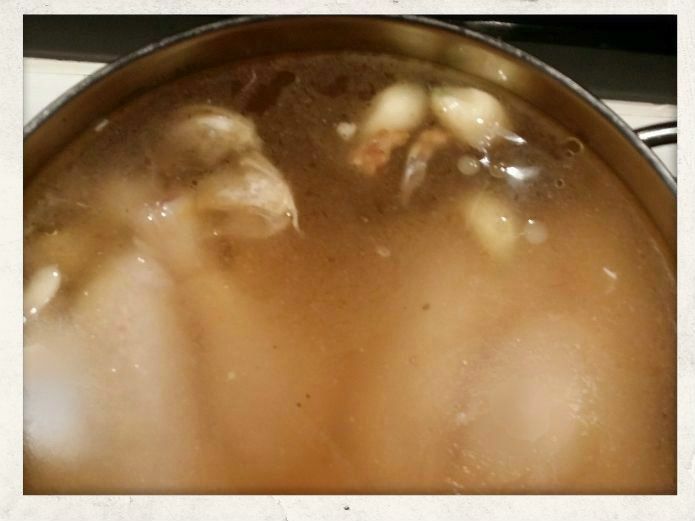 Bring to a rolling boil first, lower the chickens submerged in the liquid and turn the heat down to a simmer. With only a soft bubble on the surface, this manner is poaching the chickens. 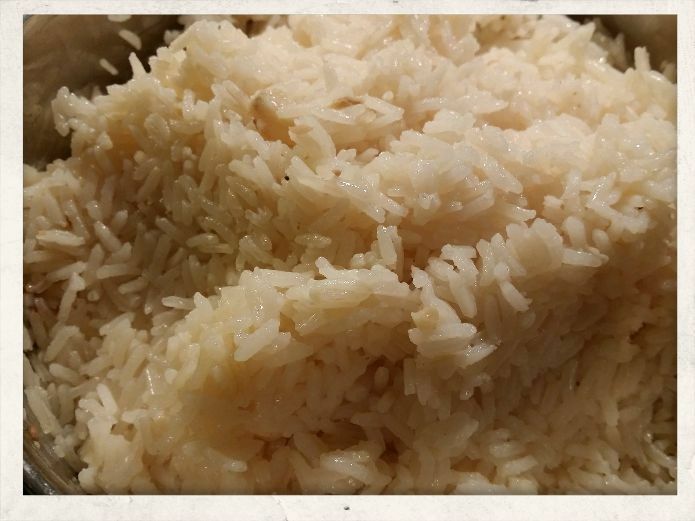 Method 1: Wash 6 cups of rice and cook in cooled poaching stock for a fragrant rice with a light aroma. 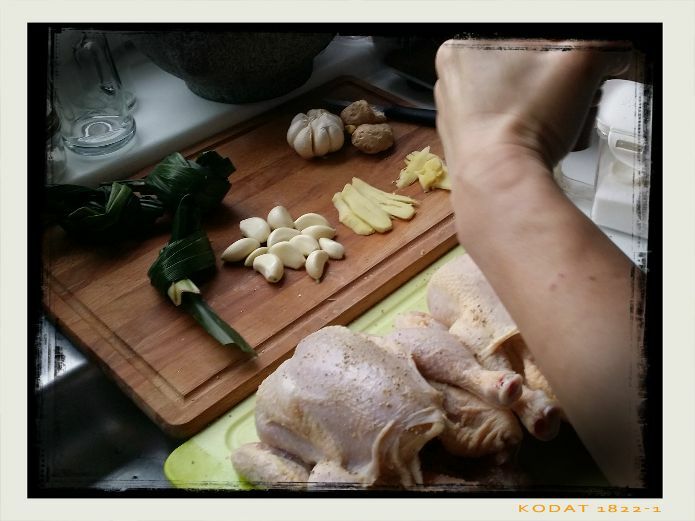 Method 2: Fry chicken fat in 2 tablespoons of oil together with the smashed garlic and ginger till its golden brown and fragrant. Add the rice, keep stirring coating all the rice kernels with a thin layer of chicken fat oil. Add the rice wine while it sizzles keeps mixing, as soon as you smell fragrance lifting up this signals to add the poaching liquid to cook the rice. At the end when you fluff up the rice remove the aromatics. 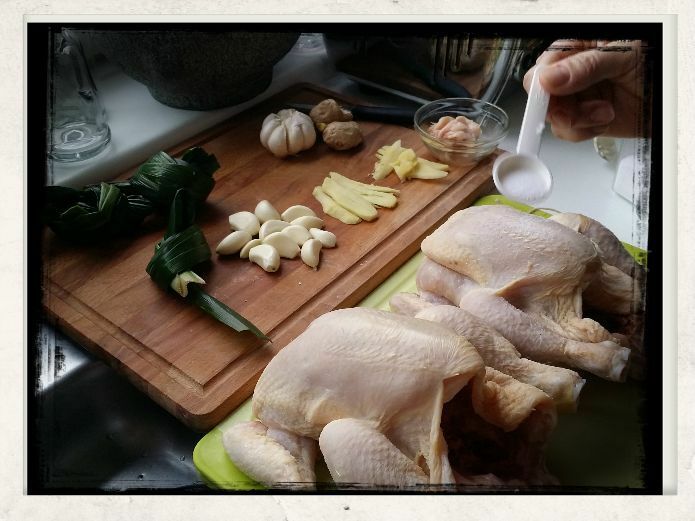 Method 3: Make a rice paste first, by pounding the chicken fat, ginger and garlic together with seasonings. Then fry the paste into 3-4 tablespoons of oil for 3-4 minutes releasing an aroma. Add the rice and mix to coat the rice. 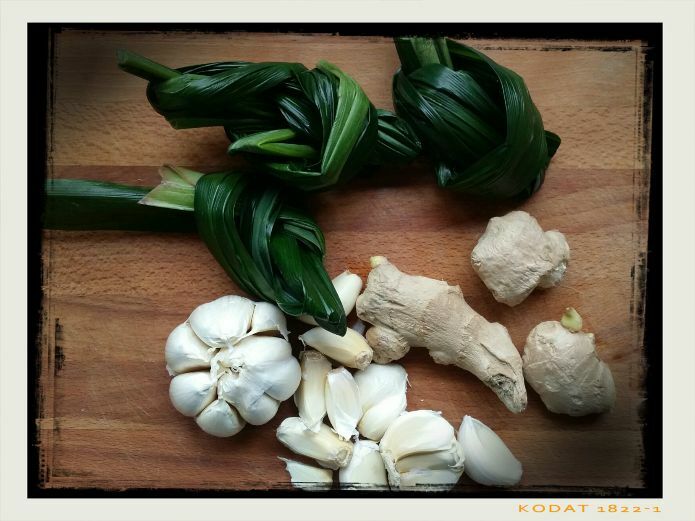 Pour the stock with pandan leaves to cook till the rice is ready. 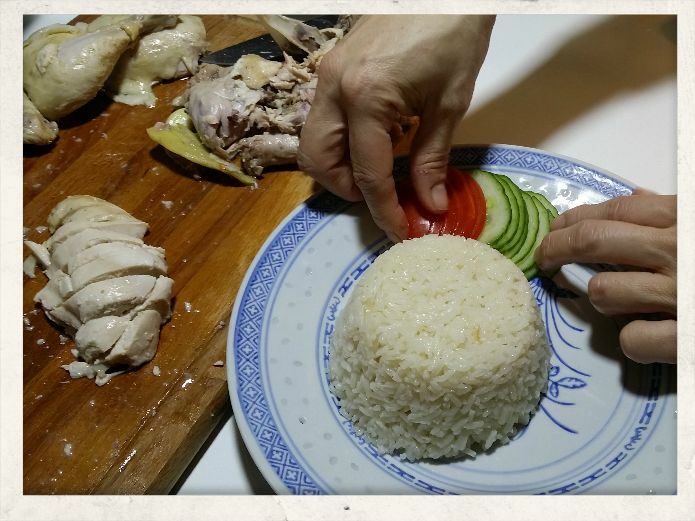 Of all three methods, the rice paste will be fully absorbed producing an intensified flavour to the chicken rice. Lift the chicken up from the pan with the opening down to pour the cavity empty. 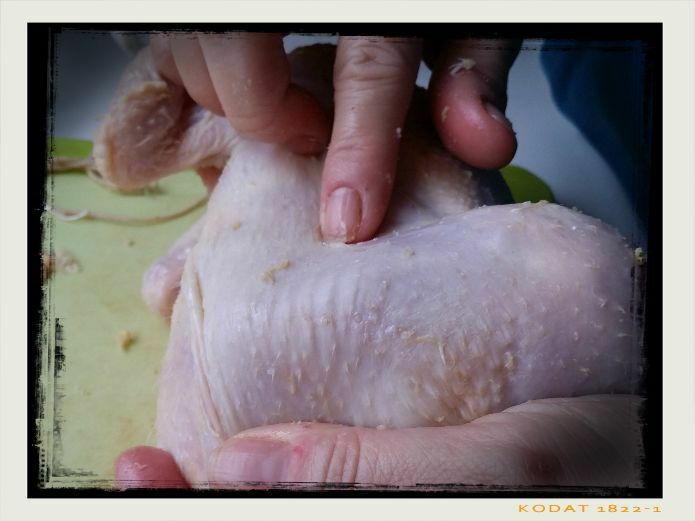 If you leave the skin on rub the chicken with ½-1 tablespoon sesame oil for extra aroma and a nice gloss. Fluff the rice pan and remove all the aromatics from the rice. 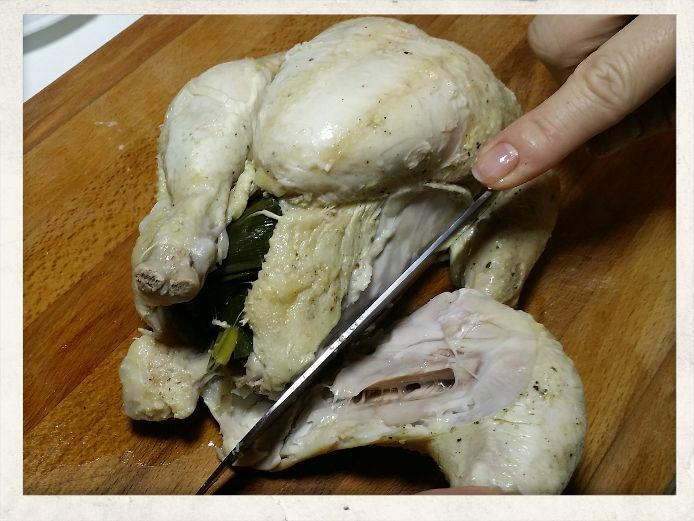 Cut off the chicken legs and remove the stuffing. This way the cavity opened up more to take out the stuffing. Now remove off the chicken wings, cut away the backbone. 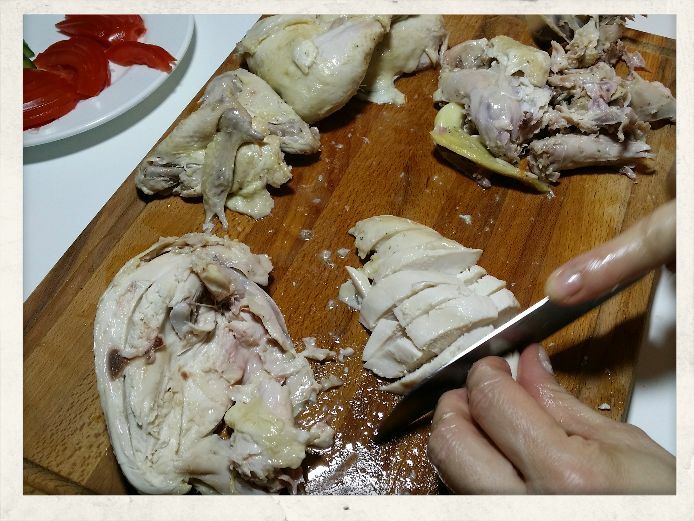 And remove the chicken carcass by pulling it off the chicken meat. 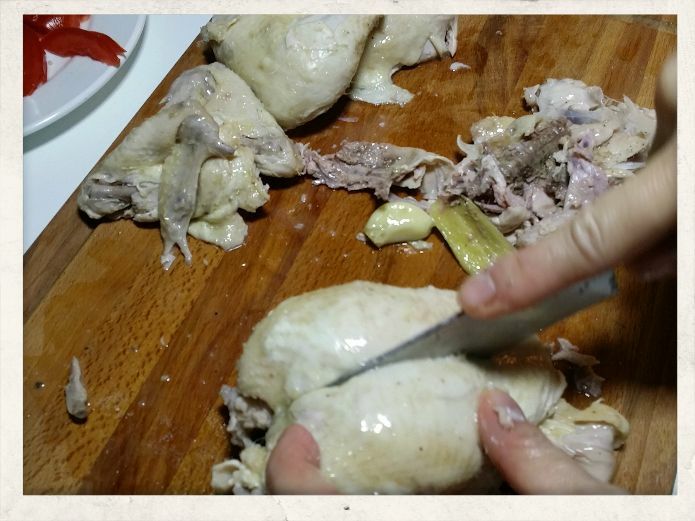 Turn the breast, remove all the bones and cartilage, with the breasts up cut through the middle and slice it up in pieces. Chop the legs with a cleaver through the bone or debone first. 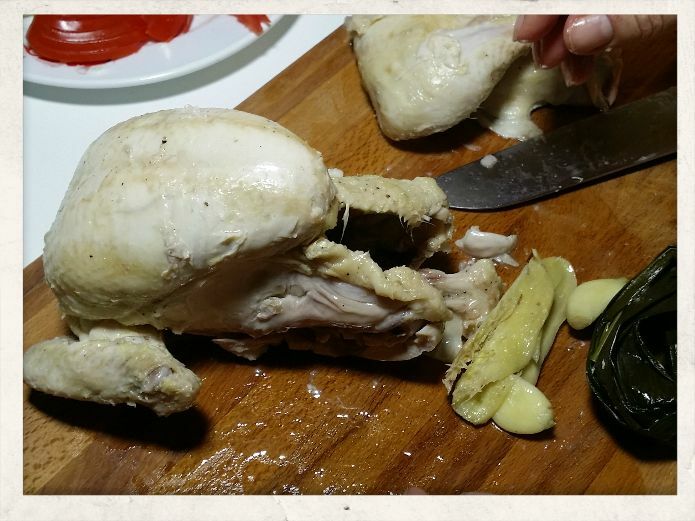 Remove and discard wing tip, chop in equal pieces. With all the cutting done, scoop the rice onto the plate add the garnish. Add condiments; dark soy sauce, chilli hot-sour sauce (and minced ginger sauce). 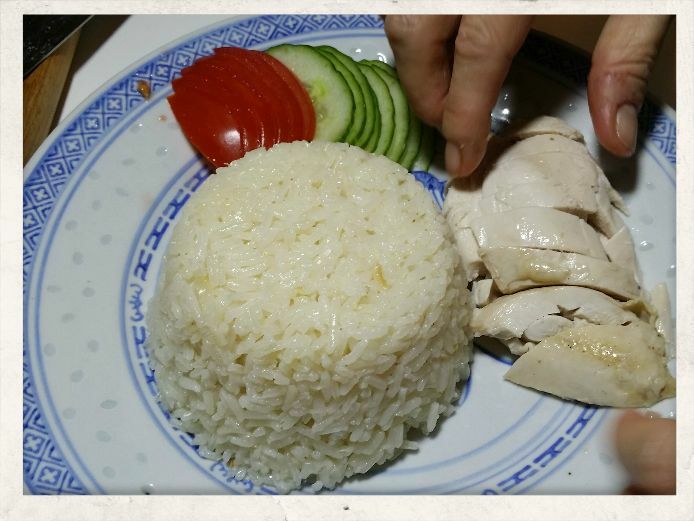 Hainan Chicken Rice Plate – Let’s jiak! – Time to makan-lah :-). As street food meal, a big bottle of ice-cold beer makes a great combination. In refined dining setting pairing with wine, I would opt for a Viognier. Why? It is a dry, medium-bodied with loads of fruit flavours. While enjoying have a look here at Singapore as your next stop. What would you like to pair with this dish? Leave a comment of even better sent me a photo how you enjoy your meal. Cheers! !